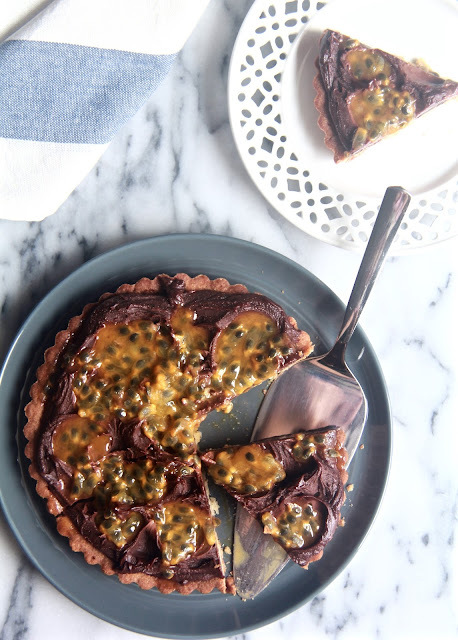 Crumbs and Cookies: caramelized cinnamon-milk chocolate passionfruit tart. Regrettably, I have had an unexplained reluctance to write this post for so long - has stringing together a paragraph of words become a chore? 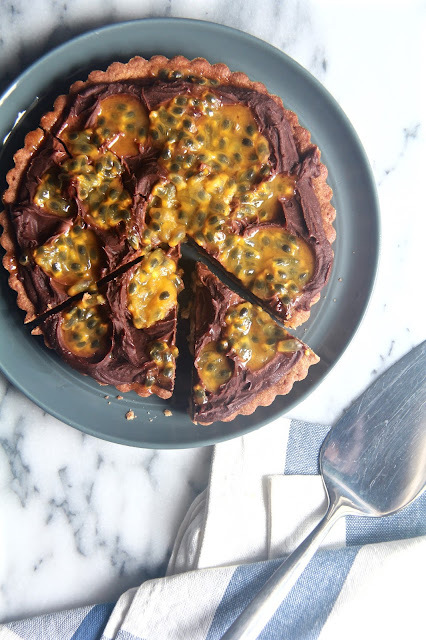 - that the finer details of this tart are perhaps forever irretrievable, though it would be near impossible to forget the depth of the caramel-enriched chocolate ganache and its contrast against the fruity sweetness of golden yellow passionfruit, my little twist on the original recipe. The cinnamon unfortunately tasted as undetectable as it was visible but who knows, it might be what espresso is to chocolate cake batter - that is, a quiet supporter which presence seemingly makes no difference, yet all the difference. Make the ganache: Bring the cream to a boil in a saucepan or a microwave oven. Keep it close to the stove. Sprinkle the sugar in an even layer over the bottom of a heavy-bottomed skillet and toss in the cinnamon sticks. Have a heatproof spatula or spoon and a small white plate at hand. Turn the heat to medium-high and when the sugar starts to melt around the edges of the pan, stir it in little circles. Work your way around the pan and as more sugar melts, move in toward the center of the pan. You want the sugar to caramelize to a burnished rust colour - put a drop on the white plate to check. When you've got the colour you're looking for, remove the skillet from the heat, stand back and slowly pour in the hot cream; it will bubble up furiously. When the seething has subsided, stir to make certain that the caramel and cream and blended. Let the mixture steep for 45 minutes. Strain the caramel cream into a 2-cup measuring cup; discard the cinnamon sticks (or wash and dry them and bury them in a jar of sugar to make cinnamon sugar). If the cream measures less than 1 1/4 cups, add additional cream to bring it up to the measure. Put the chopped milk and bittersweet chocolate in a large heatproof bowl. Transfer the caramel cream to a nonstick skillet and bring to a boil over medium heat. Pour half of the caramel cream over the chocolate. Wait 30 seconds, then using a small spatula and starting in the center of the bowl, stir the cream into the chocolate in small concentric circles. When the caramel cream and chocolate form an emulsion, pour in the remainder of the caramel cream. Once again, starting at the center and moving in ever-widening concentric circles, stir the cream into the chocolate. Refrigerate the ganache for about 1 hour, until it has just barely firmed up, think the consistency of a frosting that is suitable for piping. 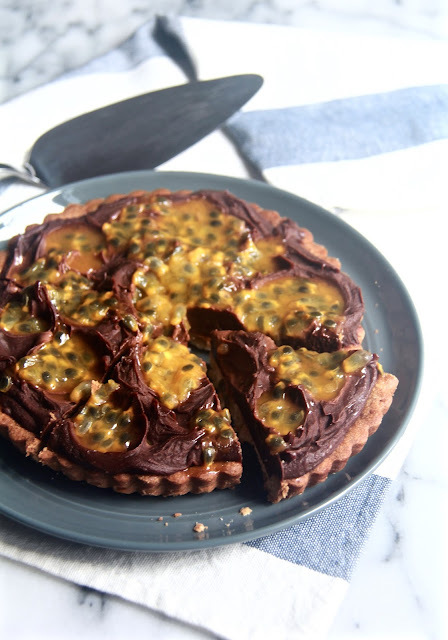 Scrape the ganache into the tart shell and use a spatula or the back of a spoon to create random swirls. Refrigerate tart until the ganache is set, roughly 2 hours. Spoon the passionfruit pulp into the hollows of the swirls and allow some to spill over for a more natural casual look; serve. Hello, Thank you for sharing this recipe. 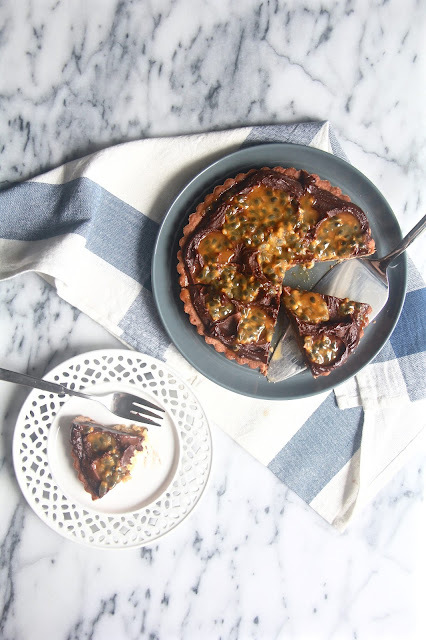 I am a tart lover and I search for different tart recipes and I was searching for very long for a new and innovative tart recipe. Today I got it and all thanks to you. I just love tarts and I like it real fresh but I don't have time to bake it regular so what I prefer is to make it once and store it in Tupperware airtight box so that I can eat it fresh. I used a tupperware april flyer 2019 and I from that flyer I found where to order the tupperware box and then finally I got it delivered to my house easily. They got some best quality Tupperware air tight boxes. Now I will definitively gonna try this recipe and bake lots of tarts in once. Thank you once again.